Cover of the December 1983/January 1984 issue of American Craft. A 1983/1984 article on Judy Kensley McKie marks her progress from self-taught woodworker to assured furniture designer and maker. At the heart of the sixth floor of 72 Spring Street in New York City is the American Craft library, one of the largest collections in this country of craft, art and design books documenting the studio craft movement from the 1940s to the present. The over 14,000 volumes include the Council’s 68-year publishing history—all past issues of Craft Horizons and American Craft. We’d like to share some of this amazing past with you each issue as we dig through the stacks. And if you happen to be in New York, the library is open to the public by appointment. The recipient of numerous accolades, McKie was elected a Fellow of the American Craft Council in 1998. Her peers in the Furniture Society presented its Award of Distinction to her in 2005, the same year that the Smithsonian Institution’s James Renwick Alliance honored her with its Master of the Medium Award; in 2008, she received the Luminaries Award from the Fuller Craft Museum. Her work is represented in museum and public collections around the country. Works by Judy Kensley McKie. 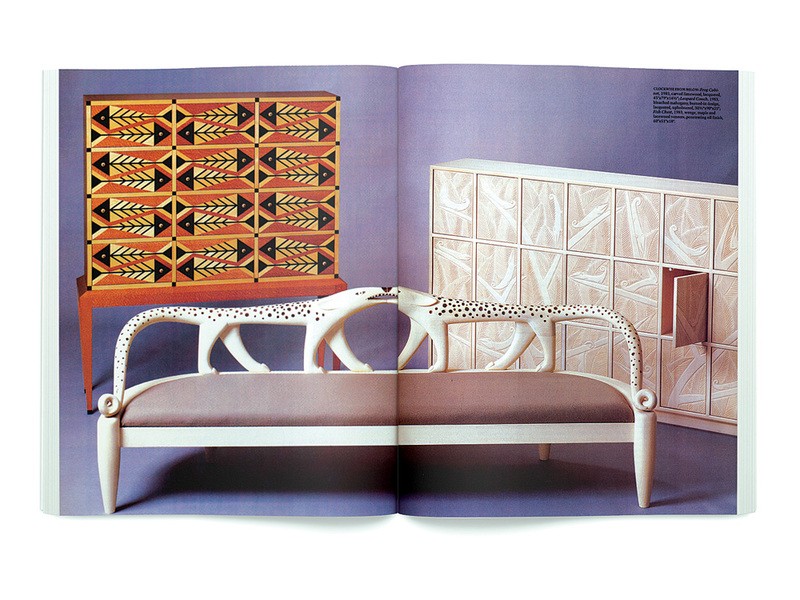 Clockwise: Frog Cabinet, 1983, carved limewood, lacqueres, 45 x 79 x 14.5 in., Leopard Couch, 1983, bleached mahogany, burned-in design, lacquered, upholstered, 30.5 x 90 x 25 in,; Fish Chest, 1983, wenge, maple and lacewood beneers, penetrating oil finish, 60 x 51 x 18 in. 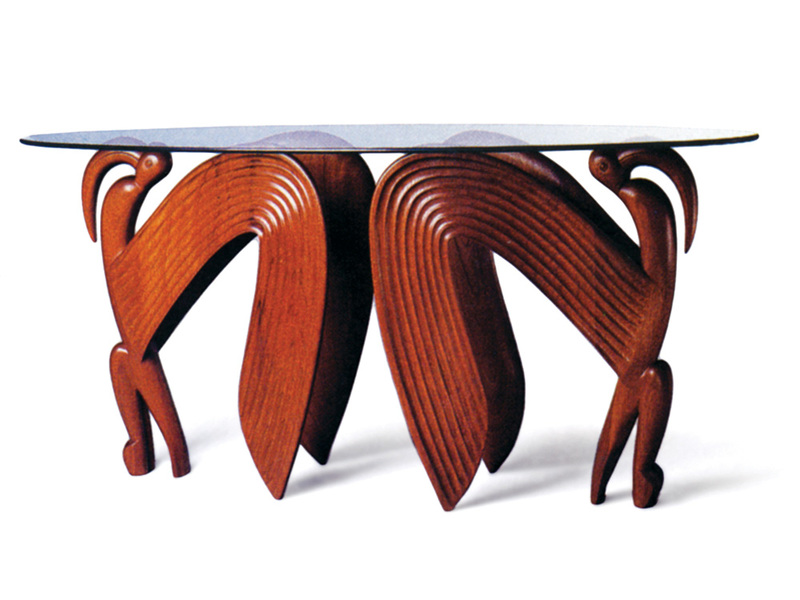 Judy Kensley McKie's Bird Table, 1983, edition of two, carved mahogany, penetrating oil finish, glass top, 34 x 72 x 26 in. 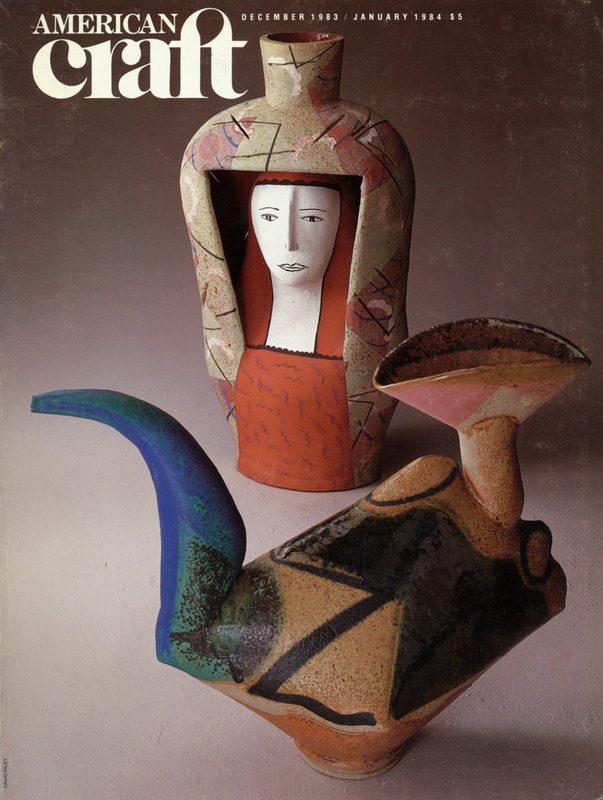 In the October/November 1982 American Craft, Betty Park profiled the singular Bay Area artist Dominic Di Mare, whose mixed-media sculptures drew on deeply felt experiences. Christine Kaminsky notes the varied artistic directions Di Mare has pursued in subsequent decades.